Alberta is undoubtedly one of the most breathtaking places on earth, as vast as it is varied in landscapes and experiences. And the best part is – almost the entire province is accessible. Highways, trails and rivers link the rugged beauty of the Canadian Rocky Mountains, turquoise lakes, boreal forests, rolling grasslands and prairies. For those seeking assistance packaging Alberta’s rich experiences, escorted tour operators are plentiful. 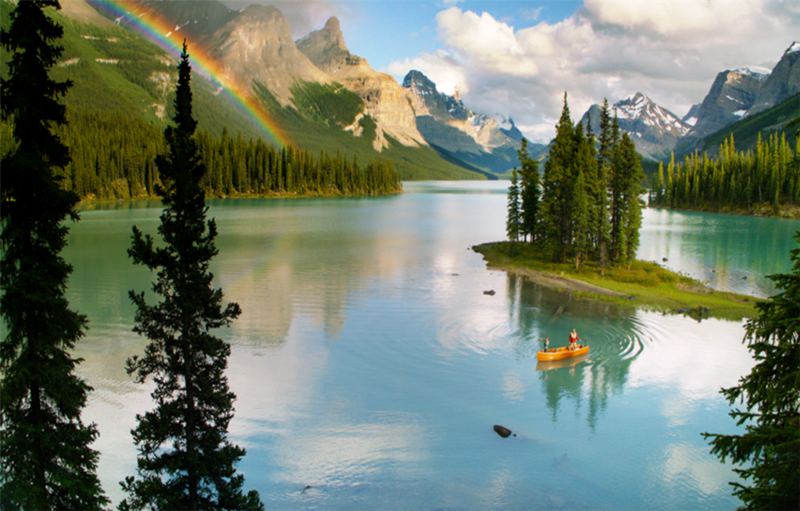 Located in the heart of Western Canada, Alberta is bordered on the west by the majestic Canadian Rocky Mountains. To the east lie the badlands, a wind-eroded moonscape of multi-hued canyons, hoodoos and coulees, long-ago home of the dinosaurs. 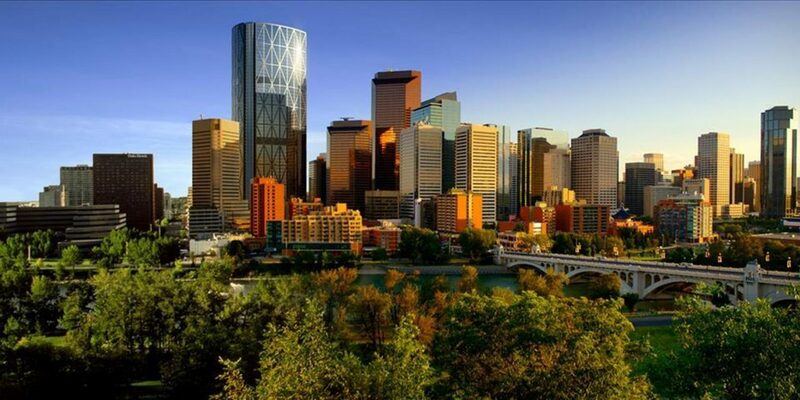 The two gateway cities of Calgary or Edmonton are excellent hubs for tours to the prairies or the mountains, with direct flights arriving in less than five hours from many U.S. cities. And with no jet lag, you can immediately immerse yourself in the delights of your Alberta adventure. Or, if traveling from the United States by coach, there are border crossings through Montana bringing you into Southern Alberta. Bart Donnelly, director of travel trade, North America for Travel Alberta, has seen a shift in the types of groups visiting. “Alberta still remains among the top performing escorted destinations for series operators running full coach programs to the Canadian Rockies. However in recent years we’ve seen a growing number of smaller tour programs with fewer passengers, and there’s an ever increasing presence of multi-generational family programs being offered. Set dramatically between prairies and peaks, Calgary is a chic urban landscape surrounded by incomparable natural grandeur. It’s a place to savor world-class cuisine and a multitude of music and arts festivals, as well as rich western heritage. Delve into the culture and history of Alberta at the Glenbow Museum or step back in time at Heritage Park, a lively western town of yesteryear. The vibrant city of Calgary has endless opportunities for urban delights and outdoor adventures. The new exhibit of penguins has Calgary Zoo bursting with pride, Telus Spark Science Centre pulsates with fun for travelers of all ages and Canada Olympic Park showcases a variety of outdoor adventures like ziplining for those seeking an adrenaline rush. You might also catch a glimpse of one of the Olympic hopefuls training for gold at the top-notch facility, or check out Canada’s Sports Hall of Fame to relive famed athletic feats of the past. For 10 exhilarating days every July, the Old West comes alive with true western hospitality and rousing fun. The Calgary Stampede is a celebration of western values and heritage and boasts the richest outdoor rodeo in the world, thrilling chuckwagon races, a spectacular theatrical presentation known as the Evening Grandstand Show, world-class agricultural attractions and competitions. In the Indian Village, a cornerstone of the Stampede since 1912, visitors step back in time to share in authentic Plains Indian cultural practices. Every man becomes a cowboy and every woman a cowgirl during Stampede. Edmonton, Alberta’s capital city, is known as the “Festival City” for good reason. Annually over 30 festivals draw acts and visitors from around the world. When not tapping a toe, watching a Shakespearian play, cheering on champion cowboys or racing in a cross-country ski festival, the city is active with tours of local attractions like the architecturally grand Alberta Legislature Building, wildly contemporary Art Gallery of Alberta and seemingly misplaced yet intriguing pyramids of the Muttart Conservatory. Fort Edmonton Park is a living history museum in the biggest urban park in North America, extending the length of the city along the North Saskatchewan River. Let your group escape the urban bustle without leaving the city in the parks and pathways winding along the river – the longest stretch of parkland on the continent. Over 3,500 restaurants, coffee shops and pubs serve up the best Alberta beef in Edmonton. Old Strathcona is one of Canada’s top shopping districts, offering a variety of shops, dining and pubs. And a trip to Edmonton is not complete without stopping at the biggest attraction of all. West Edmonton Mall offers more than just 800 shops. At one end of the mall an enormous indoor waterpark with wave pools, waterslides and bungee jumping delights the family. At the other end is a skating rink. The parking area surrounding the mall can accommodate tour coaches easily. Jasper National Park, surrounded by soaring peaks, thundering waterfalls and ancient glaciers, is an untouched wilderness of evergreens and turquoise lakes tucked into alpine valleys. Canada’s largest Rocky Mountain park is the stuff that postcards are made of with nearly 615 miles of hiking trails just waiting for your groups to explore. Peaceful. Unpretentious. Authentic. The town of Jasper, an inviting mountain community where the locals welcome you as a long-lost friend, is the soul of Jasper National Park. You will find all the comforts you could wish for, from luxury accommodation to charming cabins to eclectic dining options. Wildlife is abundant, even right in town. Where else will you find a herd of elk napping on the lawn? In the summer, the sun sets around 10 p.m., allowing for a full day of experiences. Discover the alpine tundra with a bird’s-eye view of glacial lakes and six mountain ranges on board the Jasper Tramway, the longest and highest guided aerial tramway in Canada. In Maligne Valley enjoy a walk along the canyon on an interpretive trail with posted signs describing the area’s geological history. Waterfalls, fossils, potholes and underground stream outlets are just some of the wonders of Maligne Canyon. Millions of years of swirling, churning water has worn the canyon, only two feet across at some points, to a depth of more than 150 feet in other spots. Just a short distance away brings you to Maligne Lake, where you can enjoy a 90-minute interpretive boat cruise and snap a picture of Spirit Island, one of the most photographed islands in the world. Not to be missed is the Columbia Icefield Interpretive Centre. Board a Brewster Ice Explorer specially designed with massive all-terrain wheels that tread delicately onto the Athabasca Glacier so that you can walk atop the tongue of a 10,000-year-old sheet of ice. Breathe in the cool mountain air, savor the brilliant sunshine reflecting off the snow, spin around to see the vast untouched landscape and join countless others who always say the same first word: “Wow!” Don’t forget to bring an empty water bottle onto the glacier to taste the best water on earth. One of the biggest new attractions in Alberta is set to open in spring 2014. The Glacier Skywalk will provide a state-of-the-art viewing experience with an interpretive boardwalk and glass-floored observation platform extending 100 feet out over the Sunwapta Valley. Visitors will gain a rich understanding of the geographical, geological, glaciological, environmental and evolutionary history of the area. 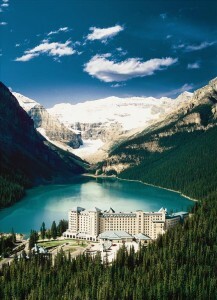 Flanked by the Rockies, the town of Banff and hamlet of Lake Louise are undoubtedly the jewels in the crown of Canada. For over 125 years Banff National Park has welcomed visitors coming by train, horse, coach, van and bicycle. There are so many ways to explore the park. Professional guides take you on hikes through fragrant pines to windswept mountaintops; watch eagles glide below. Float along a lazy stretch of the Bow River while a guide describes the glacial topography or rent a canoe for a more independent experience. The town of Banff itself is a shopper’s mecca. Its main street is full of shops offering mountain art, mountain wear and a store with a mountain of candy. With more than 125 eateries/pubs there are numerous options from fine dining to fast food, local beer to award-winning Canadian wines. A must see in Banff is the “Castle in the Rockies” – the Fairmont Banff Springs Hotel, a hostelry rich in history. 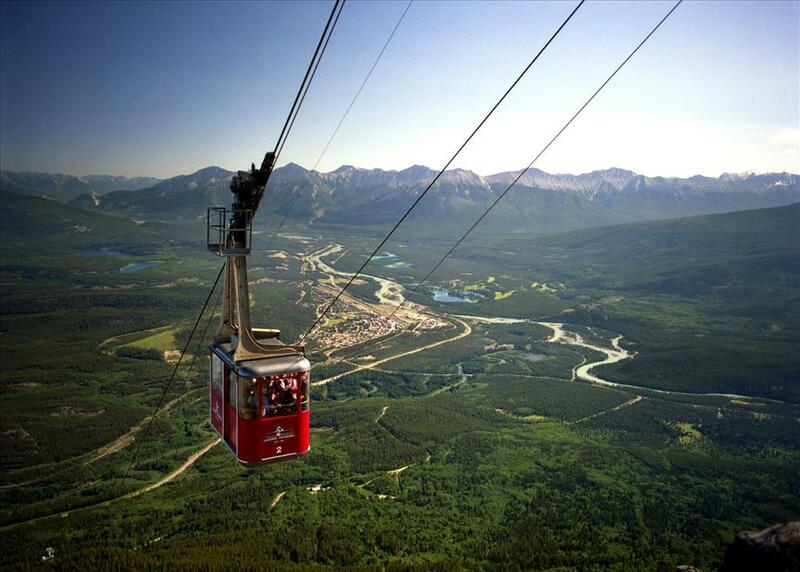 For an exceptional view of the entire Bow Valley, ride to the top of Sulphur Mountain on the Banff Gondola and take in the breathtaking views in every direction. Surrounded by six mountain ranges, see the townsite of Banff nestled far below. Close by on Sulphur Mountain is the famous Banff Upper Hot Springs. Relax as you soak in the soothing warm, mineral-rich waters seeping from the same hot springs that spawned the creation of Canada’s first national park. You can even rent one of the old-time bathing suits. A short distance from downtown Banff is The Cave and Basin, which will reopen in summer 2013 after an extensive $13-million renovation. The changes to the historic landmark are remarkable, highlighting both the sacred Aboriginal history and the discovery in 1883 by three railway workers who put the hot springs and Banff National Park on the world map. Explore brand-new interactive exhibits that tell the story of how this remarkable little spot in the Rockies became the birthplace of Canada’s national parks. Groups can reserve an after-hours Lantern Tour of the caves for a delightful sensory experience as the cave seems to come alive with sounds of an unconventional orchestra of bubbling thermal water, a babbling stream and special sound effects. No visit to Banff National Park is complete without heading to Lake Louise. This alpine lake, known for its sparkling blue waters, is situated at the base of impressive glacier-clad peaks that have long been at the heart of Canadian mountaineering. The lake offers a delightful paddling experience in the warm summer months. Life moves in perfect unison with the sights and sounds of the wild as you guide your bright red canoe across the brilliant blue-green waters toward towering Victoria Glacier. 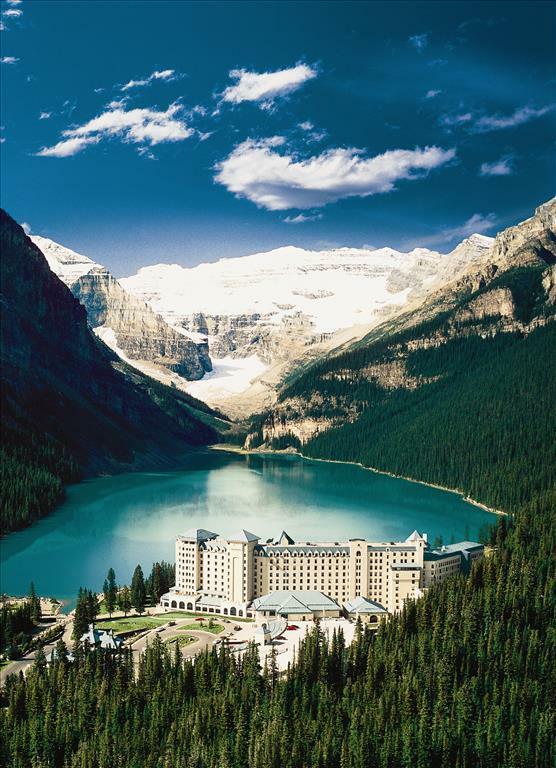 A leisurely walk along the path surrounding the lake is a highlight for travelers of all ages and abilities as is lunch or tea at the famed Fairmont Chateau Lake Louise with its awe-inspiring views of the lake. If you want to surprise your group with the most iconic image of Canada and the Rocky Mountains, schedule a “surprise” visit from an RCMP officer dressed in the proud RCMP red Serge uniform, felt hat and riding boots. A photo with the officer will grace everyone’s mantel for years to come. Travelers of all ages are mesmerized by the timeless vistas of Alberta when traveling by train. Experience the Rockies by rail either on VIA Rail or Rocky Mountaineer. Travel through the remote wilderness of high mountain passes, glacial rivers and deep canyons. Glimpse wildlife you would rarely see from the road. In Alberta travelers can board VIA Rail either in Jasper or Edmonton. The Rocky Mountaineer offers routes with stops in Calgary, Lake Louise, Banff and Jasper. Both trains offer a unique view of the mountain parks. Alberta offers an abundance of authentic experiences off the beaten path. Less than an hour east of Edmonton sits Elk Island National Park, which rivals the Serengeti for its density of hoofed wildlife. Feel the thrill of seeing wild bison in their natural habitat. Watch for herds of elk and the white-tail deer and moose that roam freely. Observe the antics of the industrious beaver building a dam. The abundance of animals means unbelievable photo ops on 50 miles of trails along meadows, marshes, lakes and parkland. Birdwatchers are in heaven with more than 253 species to spot. Just outside of Calgary and minutes from Banff National Park is Kananaskis Provincial Park, where the town of Canmore rests in the embrace of the famed Three Sisters mountains. There is an array of accommodation choices, making it an ideal setting for groups. From golfing at a spectacular alpine course to hiking trails and a well-maintained bike path, there’s something for every outdoor enthusiast. On a stroll through downtown Canmore pop into the funky boutiques or shops providing outdoor gear before stopping at a pub for a casual meal or enjoying award-winning Rocky Mountain cuisine at one of the eclectic restaurants. Just west of downtown is Canmore Nordic Centre, where Olympians train in winter for Nordic skiing and biathlon. The Canadian Badlands, east of Calgary, has yielded some of the world’s richest deposits of prehistoric fossils and dinosaur finds from the ancient seabed. Since the 19th century, many of the most important dinosaur discoveries in the world have been unearthed here. Spend hours exploring the Royal Tyrrell Museum of Paleontology, housing the largest displays of dinosaurs on the planet. Learn why they call their T-Rex Black Beauty. Go on a guided archaeological dig. Learn about the “last sea dragon,” a 75-million-year-old sea reptile. The museum also offers hands-on programs for groups. If you visit the Canadian Badlands in July, witness a performance of the dramatic portrayal of the Passion of Jesus Christ in an acoustically superb natural bowl amphitheater. The Canadian Badlands Passion Play, celebrating its 20th season in 2013, has been named “One of Alberta’s Top Cultural Attractions” by Attractions Canada, and ABA has named it “One of the Top 100 Events in North America.” Guests can enjoy both matinee and evening performances. There is so much more to tell and diverse experiences to share in Southern Alberta. Head Smashed In Buffalo Jump World Heritage Site is where the world’s largest, oldest and best preserved buffalo jumps can be found. In Waterton Lakes National Park, home to the famous Prince of Wales Hotel, many groups stop for lunch or overnight. Waterton-Glacier International Peace Park shares parkland in Alberta and Montana and is part of what’s come to be known as the “Crown of the Continent,” 16,000 square miles of spellbinding scenery. With Alberta’s vast and varied landscapes and unique experiences, so much more could be written. This is just a sampling of what awaits you and your guests in Alberta.